It is safe to say that Marina Abramović is one of the most controversial, provocative and polarising contemporary artists practising today, which is already in itself no mean feat. Personifying performance art like no other artist, Marina Abramović has been attracting praise and criticism in equal and abundant measure ever since her beginnings in the early 1970s. Whether it was for the intense and confrontational nature of her iconic and haunting early work exploring the boundaries between audience and artist, the limits of the body and the possibilities of the mind to often shocking effect, which was often deemed too radical and intense, or for her revived art stardom since the overwhelming success of the 2010 retrospective at the MoMA in New York and subsequent flirting with the worlds of pop and fashion – Marina Abramović continues to surprise, confuse and irritate. Frequently using her own body as a starting point, she has subjected herself to ordeals testing physical and psychological boundaries, as she did most famously during the 736 hour-performance The Artist Is Present, where visitors were invited during the course of her large retrospective to sit opposite Abramović and share a silent but intense contact that often caused a highly emotional response – an act that in its very simplicity can be seen as a radical culmination of a 40 year-process of reduction and concentration. Marina Abramović is currently preparing the Marina Abramović Institute, a space dedicated to performance and immaterial arts due to open in the city of Hudson, New York, in 2015. In a satisfyingly confrontational and open conversation, Marina Abramović talked with mono.kultur about the nature of invisible energy, the many criticisms she has been facing and what cosmetic surgery has to do with art. Graphically, the issue is an exercise in friction and restraint, by setting up the three elements of text, images and subtitles on different grids and letting chance run its course. 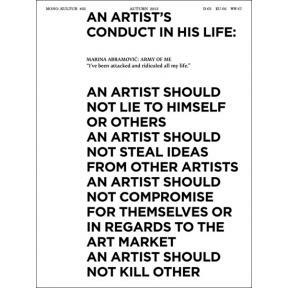 All works were selected by Marina Abramović as personal milestones in her career.